A sedation-free colonoscopy? This woman tried it. « Small steps in awareness! Everyday, we comb through hundreds of news stories to keep you up to date with the latest in colorectal cancer news, and sometimes it’s the experience of average men and women who catch our eye the most. I came across this article while checking out Twitter conversations about colonoscopies. In it, one brave woman explains her reasons for choosing to face the procedure sedation and anesthesia-free. Like many folks, Jan experiences unpleasant recovery from anesthesia, and so she opted for a drug-free colonoscopy. She was able to watch the doctor navigate her colon and remove a small polyp for biopsy. She writes, “I could watch everything unfold on screen and knew exactly what the gastroenterologist was doing. While rare, perforations of the bowel have happened during colonoscopies.” Some patients may indeed find the sense of control more comforting than full sedation. Another benefit for Jan was the quick recovery time- there was no need to be driven home from the appointment. As for discomfort, she describes it as minimal, the worst of it being a temporary cramping sensation that lasted about 30 seconds. She agrees with many people that the preparation was much more uncomfortable than the actual procedure- and she was awake for every second of it! Please give the full article a read and show your support! We’re so glad that Jan shared her experiences and we hope that it puts you at ease for your next check-up, whether you choose anesthesia or not. Print article This entry was posted by KaitWallace on 9 March 2010 at 14:55, and is filed under Uncategorized. Follow any responses to this post through RSS 2.0. You can skip to the end and leave a response. Pinging is currently not allowed. 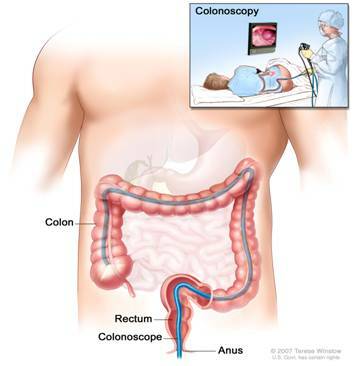 Colonoscopy without sedation is NOT a painful procedure. The Versed isn’t given to “relax” patients, nor does it provide any pain relief. Versed is given to cause amnesia, and fully 10% of the patients who receive it have memory loss (some long-term) after arriving home. Most docs push sedation because it makes their job easier and more profitable. My primary care doc had a colonoscopy with versed and still has signficant memory loss 1 year later. That’s very interesting- I had no idea that Midazolam (generic name for Versed- http://en.wikipedia.org/wiki/Midazolam) was given to cause amnesia, and it certainly IS unsettling to imagine lasting memory loss. Can you point us towards any studies regarding long-term memory loss and this drug? Ultimately, many patients may prefer not to remember the procedure at all! It is imperative, however, that we make sure folks are fully aware of their options (fully concious vs. under sedation) and of the risks associated with the latter. Thank you so much for commenting on the CCAC blog!